I recently became the proud owner of a large and rather undisciplined 2 year old rescue boxer. He came with a resource guarding label and, to be honest, that was always in the back of my mind after bringing him into my home. I had already been in contact with Janet as Boxer Rescue Ontario (BRO) uses her for behaviors issues with BRO dogs in the area. At one point, I had growing concerns that I had made a mistake; that I was not ready or able to handle Rufus. Janet literally came to my home the very next day that I called her to express my concerns and fears. She stayed with Rufus and me for hours, working with the two of us on a variety of issues and training techniques. She taught me how to be calm and assertive with Rufus, while being fair and reading his language. 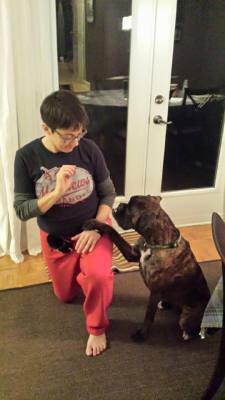 Janet does not only helps train your dog, but also gives you the confidence and tools to train your own dog. 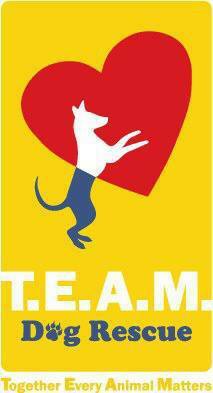 My name is Nancy Gothard, one of the founding Directors of TEAM Dog Rescue. I have known Janet for 2 years, and we have grown to become good friends and I have the highest respect for her as both a professional dog behaviorist, and a friend. As a behaviorist, Janet will show you first hand that positive change will not just happen with your dog, but in how you interact with your dog and she will train you to be a better dog owner. If you have a dog whom you love, and your dog is exhibiting behaviors that are a concern and you are fully committed to making changes for your dog and yourself? Look no further. As a rescuer, Janet has always demonstrated an understanding towards dogs that are vastly misunderstood, she know that under that behavior is an underlying issue that needs tending to before anything else can be addressed, with she does not turn her back on a dog and will work with even the most complex cases, every dog has excelled in her care.